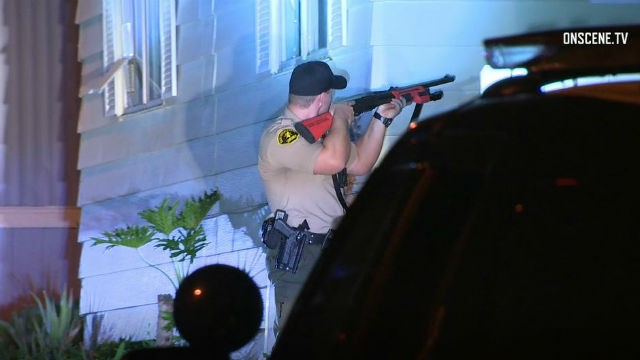 A burglary suspect who attempted to run over San Diego Sheriff‘s deputies with a vehicle was arrested Wednesday after a five-hour standoff in Fallbrook. Dispatchers received reports around 11 p.m. Tuesday of a burglary at Valley View Mobilehome Park located in the 1400 block of Alturas Road, west of South Mission Road, Lt. Ricardo Lopez said. When deputies arrived and attempted to make contact, the suspect drove his vehicle at two deputies, causing them both to quickly move out of the vehicle’s path, Lopez said. No deputies were injured. The suspect then barricaded himself inside one of the trailers and refused to come out, Lopez said. SWAT and crisis negations teams were dispatched to the residence. SWAT officers shot at the trailer with rubber bullets and tossed pepper grenades inside to get the man to come out, 10News reported. Around 4 a.m., the suspect, later identified as 28-year-old Walter Wilches, exited the residence and was taken into custody without incident, Lopez said. Wilches was booked into the Vista Detention Facility on suspicion of assault on a peace officer, Lopez said.